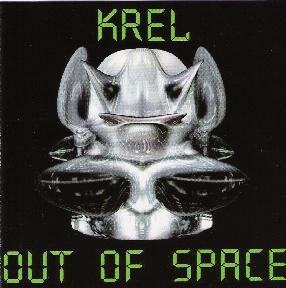 Krel - "Out Of Space"
Krel's Ad Astra was the first release on Andy G's Dead Earnest label and Out Of Space is the long awaited follow-up, consisting of tracks from the unreleased 1992 Shed Studio sessions, live tracks from their tour opening for Hawkwind in 1992, plus newer material. I've been waiting impatiently for this to be released and I'm pleased to report it was more than worth waiting for. "Mober" is a deep in the cosmos intro track that spends 5 minutes building an edge-of-your-seat sense that any minute something is going to explode. And indeed it does… "Barricades" is a monstrous rocking space rock track with Mr. Dibs on vocals that could easily be a Spacehead tune. This is heavier than anything I recall from Ad Astra (I believe Ad Astra consists of music recorded after Dibs left). Personally I love this heavy stuff. Hawk rock of the highest order. A real highlight along these lines is the nearly 10 minute "It's Alive", an outstanding jam tune with rocking and wailing space guitars, trademark bubbly gurgly UFO synths and a throbbing, rocking, mind-bending power drive. Wow… a fantastic track. "Zero G" is a short, easier paced instrumental with a deep space Pink Floyd-Tangerine Dream combination feel and touches of Blues guitar. "The Visit", "Golden Tether" and "Release" are a trio of keyboard dominated tracks, with "Release" in particular sounding like a Harvey Bainbridge journey. And for just damn good songs the spotlight shines brightly on "Star Of Last", "Androids" and "Space Trip". In summary, Krel couldn't be deeper in Hawkwind territory but they do it oh so beautifully. Absolutely yummy cosmic and completely mind massaging SPACE ROCK. Highest recommendation. For more information you can visit the Dead Earnest Records web site at: http://www.deadearnest.btinternet.co.uk.